After spending so much time doing research for every garb project over the past few years, I decided it was time to do something fun and just make a dress that looked like a picture. The other objective is that it would be light enough to wear on an archery range in the summer. That’s it. 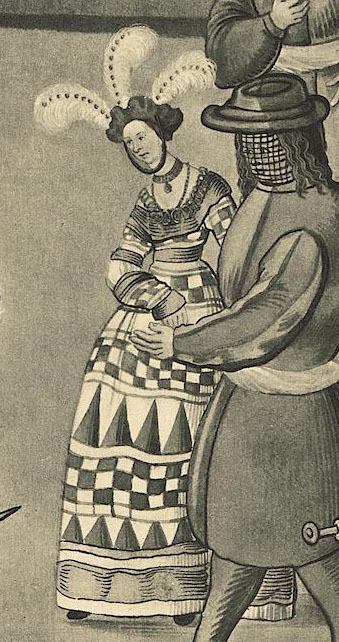 I have no idea how the dress was made in period. This process it totally my own. I enlarged the image and made a scale drawing of it, measuring each row of checks and triangles in cm. I had to scale it to my height. The lady in the image is proportionally much taller than me, so I had to lose a couple of rows on the bottom to make the dress appear correct. To determine which colors to use, I scanned my drawing into Photoshop and used the painting function. I was not going to embark on a project like this without seeing some sort of color mockup. The piecing was going to take a long time (it took me a month to make the dress) and I didn’t want to realize half way through that I had made a mistake. Here are the color schemes that I tried. 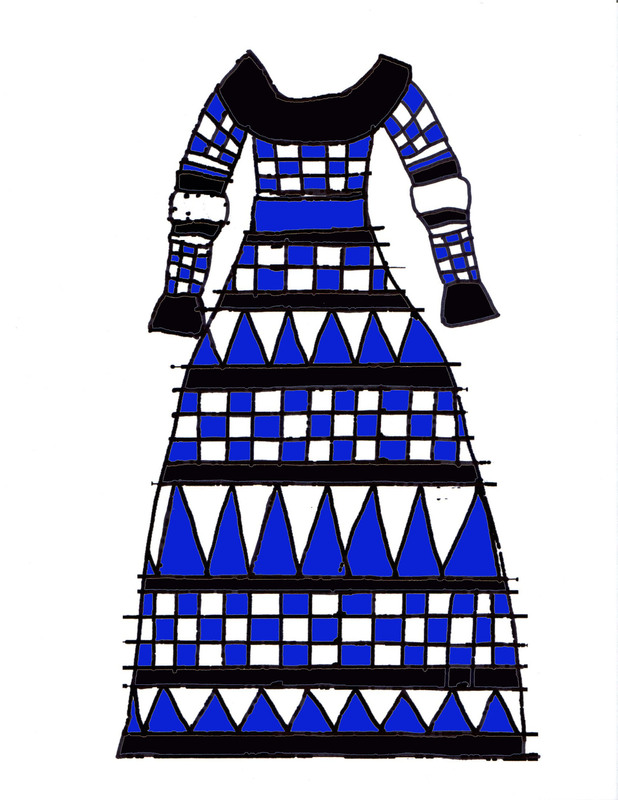 This was my attempt to make an “Kingdom of Atlantia” dress with blue and white. This came in a close second. I was surprised to find that I liked this color combination best considering how much I dislike wearing orange. To me, this looked the most authentic. I based these colors on a couple of period paintings that show this type of piecework. 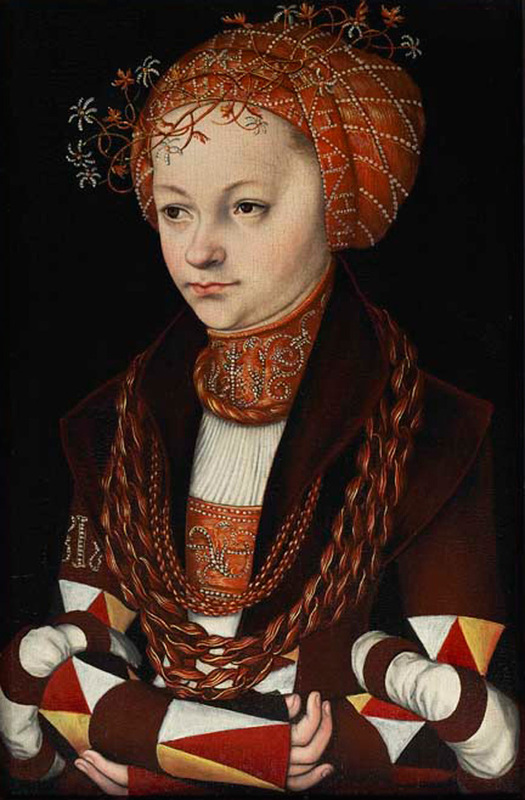 See the next image for an example. I didn’t use white because, as I said, this was field garb. After I determined the colors, I had to determine which method to cutting I would use to make the dress. 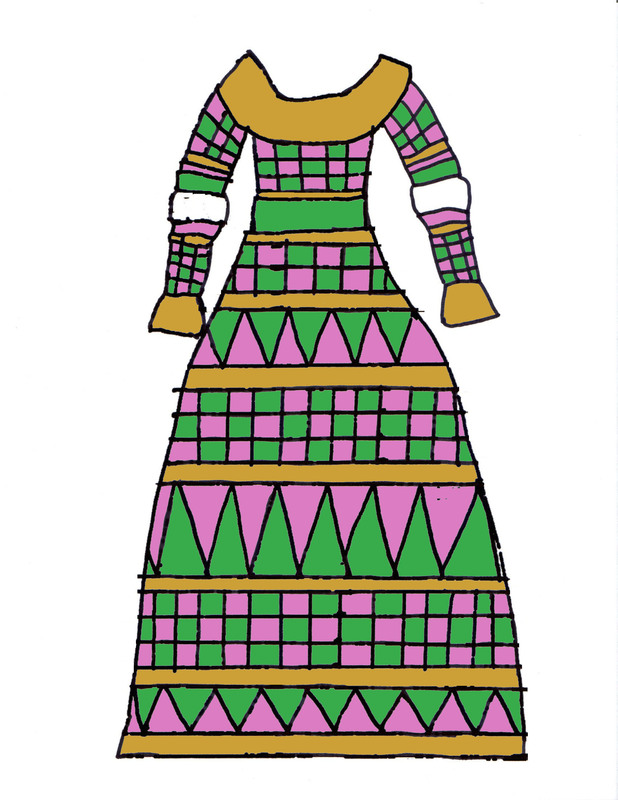 In the original drawing, the dress looks as if it’s cut in one long piece, without a gathered waist. That means the skirt would be created on a curve. See the drawing below left. That method would required advance math to make the patchwork appear proportional. This meant piecing squares that were slightly differently shaped so they would appear square when cut on a curve. I didn’t use that method. 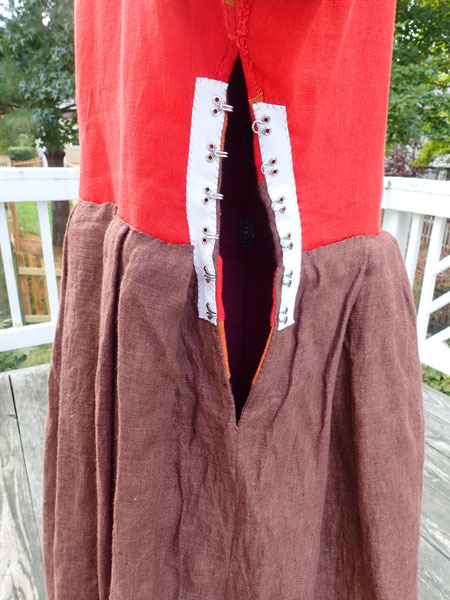 I made straight panels and gathered them into the waist of the skirt. The smaller triangles are 4” high x 5” at the base. The larger triangles are 8 ½” high x 7” at the base. 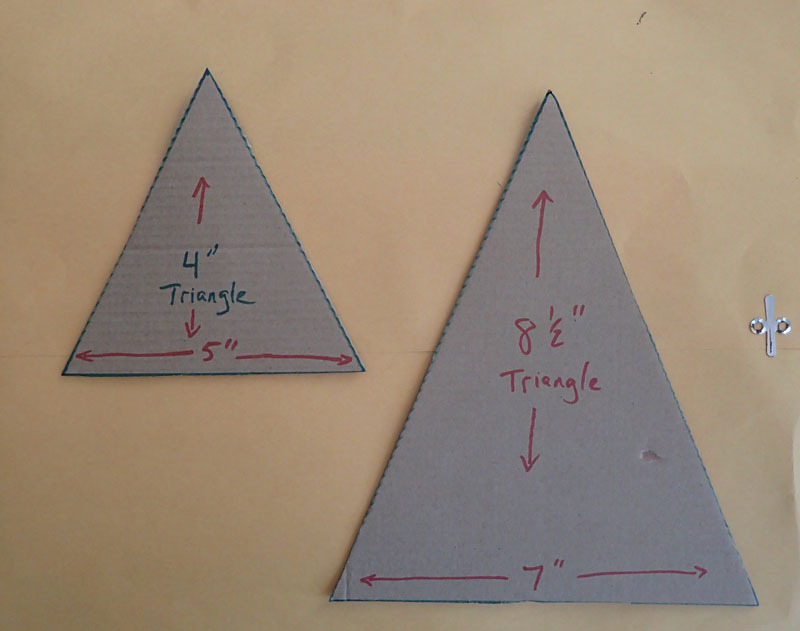 The patterns for the triangles were cut from cardboard. The squares are 2 ½ x 2 ½”. The squares were strip-pieced. (That’s a quilting method. Google it. 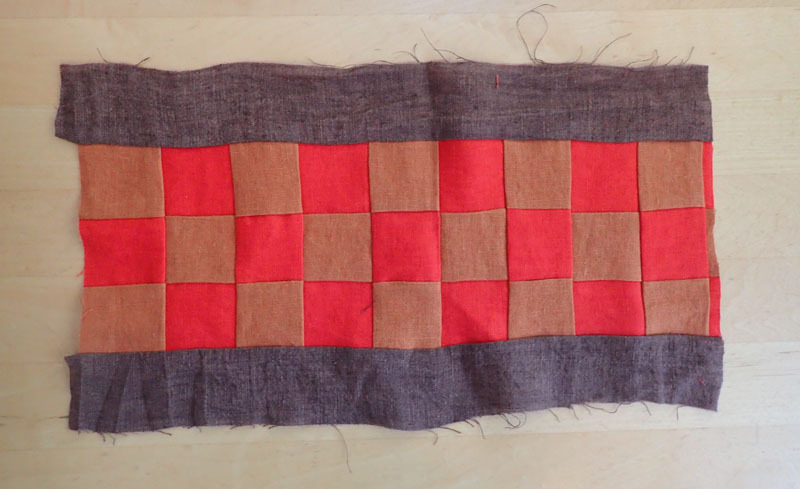 There’s lots of good tutorials on Youtube about strip-piecing.) Basically, making this dress was like making a quilt. 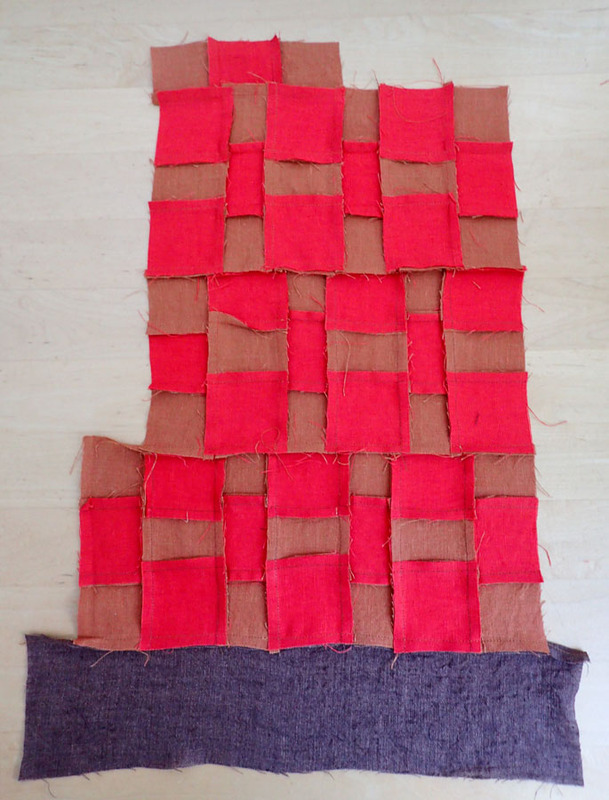 The photo below is a quick reference for strip piecing. 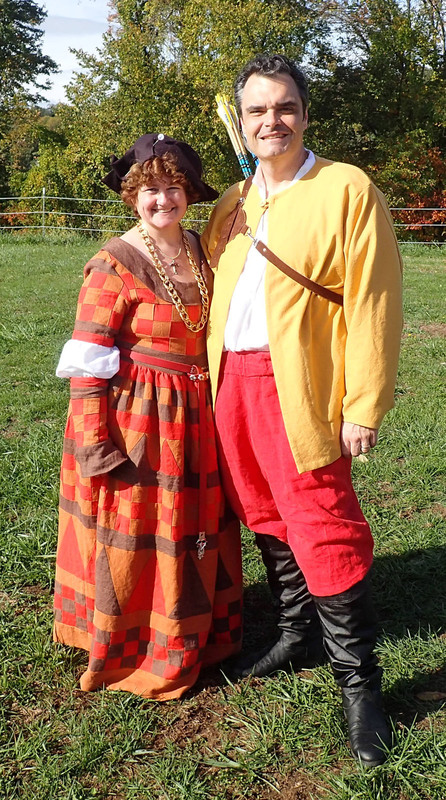 I used linen because I wanted the dress to be light enough to wear on the archery field. Ha. The linen frayed so much that I had to line the dress to protect the seams. I didn’t use my serger because I thought that the seams might become too bulky to press flat, giving the dress a lumpy appearance. These are the pieces of the bodice waiting to be sewn together. 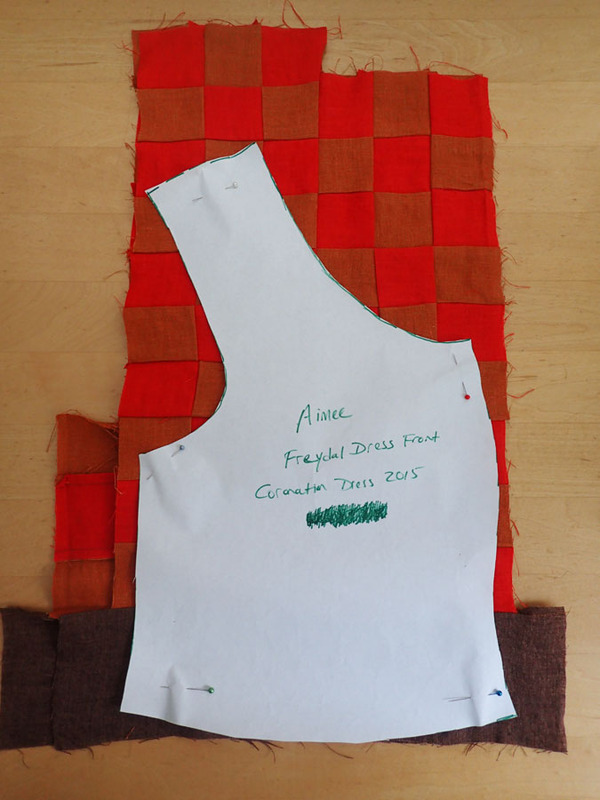 It became clear very quickly that I would have to flatline the entire bodice to keep the piecework from stretching out of shape. 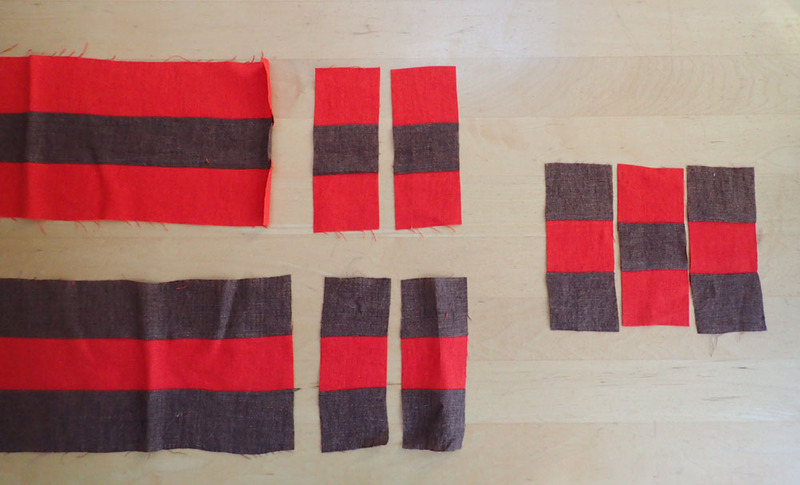 In the photo below, the pieces have already been flatlined in red linen. 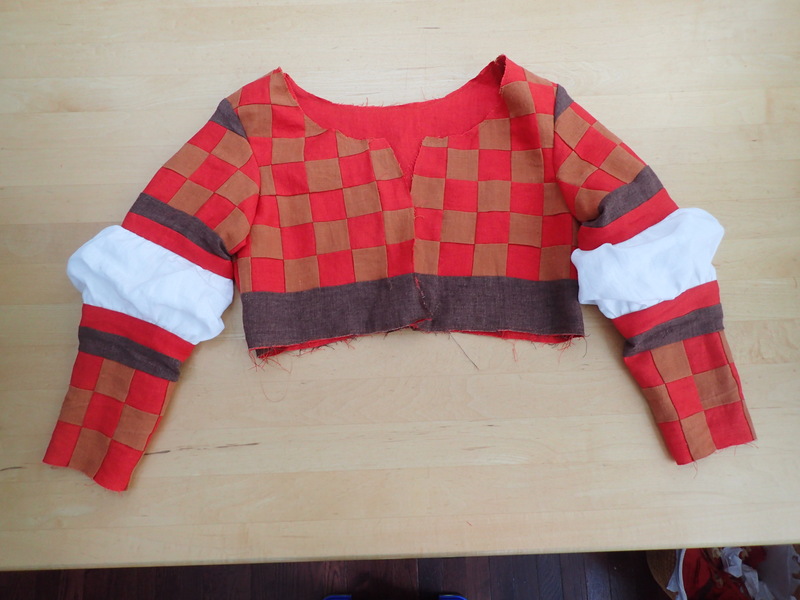 As with a lot of pretty dresses, the outer layer is not structural. 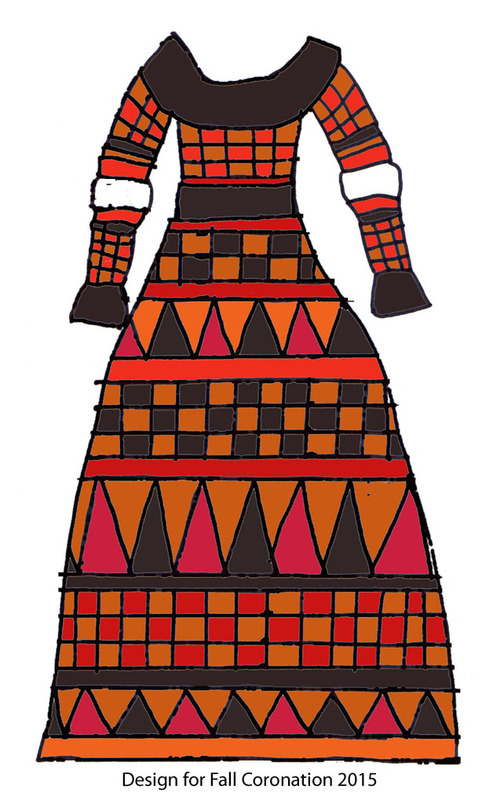 The skirt is essentially rows of checky, triangles, and straight lines sewn together. (Each of those rows of checky took two days to complete.) 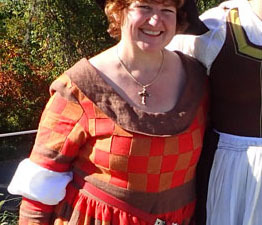 The skirt is gathered into the waist. You can’t pleat it, right? Because pleats would make the pattern appear wonky when you wear the dress. I don’t particularly care for the look of a gathered waist but it was necessary to keep the look of the pattern intact. For those of you still awake enough to keep reading, the next challenge became the closure. 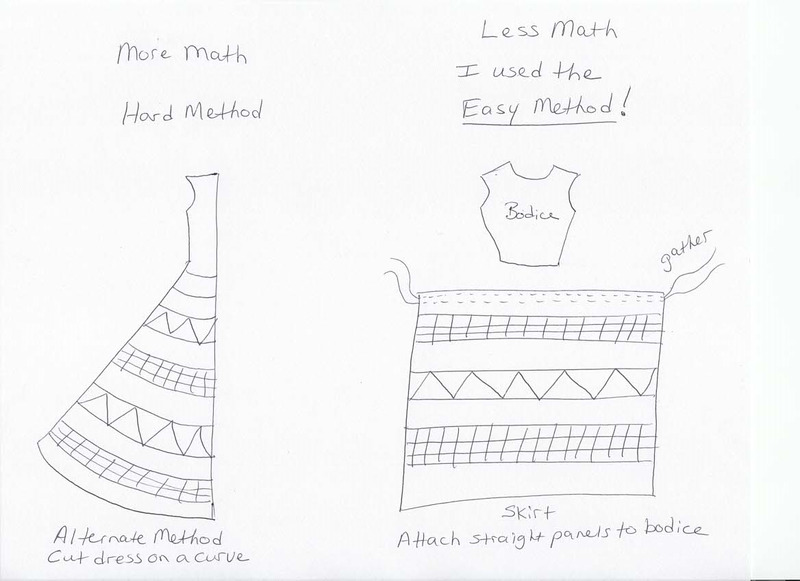 At this point in the project, I realized that I hadn’t done the math correctly and making this dress with a center closure while still maintaining the checky pattern across the bust line was going to be impossible. Um, right. Three semesters of Calculus is apparently not enough math to conquer a checky bodice. I unstitched the flatlining, sewed the bodice center front together, and restitched the flatlining. Then, I opened the bodice on the side. Note that I *never* use hook and eye tape, but my sewing room was so messy that I couldn’t find my black hook and eyes. So, this is my secret shame. I will remove the hook & eye tape and add the proper hooks and eyes later. 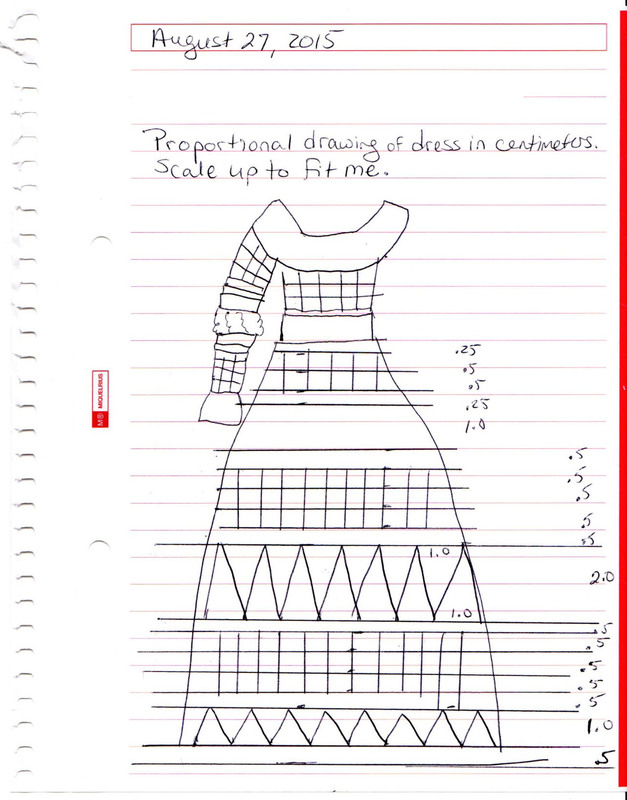 After the dress was completed, it was clear that the entire outfit needed to be lined. This is going to be a dryclean-only dress. I have long-since given up hope that I can wear this in the summer. It’s far too hot. I wore this to an event in October and I was too warm. Yeah, I know. I could get two dresses for one if I had done the lining like the outside of a dress. But, this was a learning experience. I’ll know better next time…if there is a next time. Note that you can see how the pattern of the dress collapses if you don’t have the right “floof” at the waist, as I do in the photos where I have hips and I’m wearing an under dress. 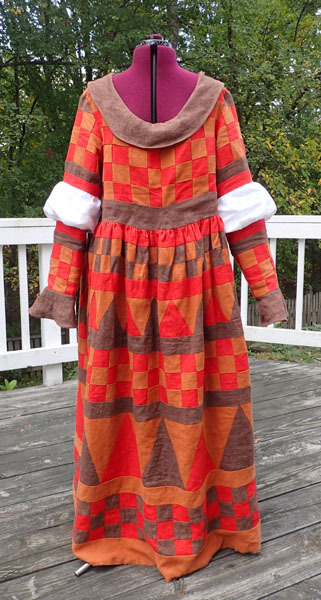 However, my one bit of advice to anyone who is foolish enough to try this project is to make the dress in wool. Linen was a horrible idea. It frays too much and it doesn’t hold its shape. Here’s the neckline at the beginning of the day and the neckline at the end of the day. Early in the day. Nice & snug. 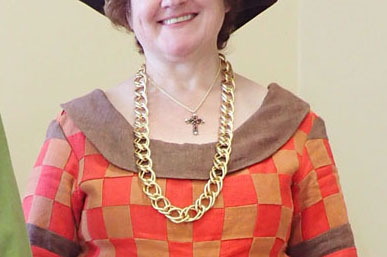 This dress is a winter dress. Make it in wool. And if you manage to piece one of the buggers together on a curve, let me know. I want to see it!